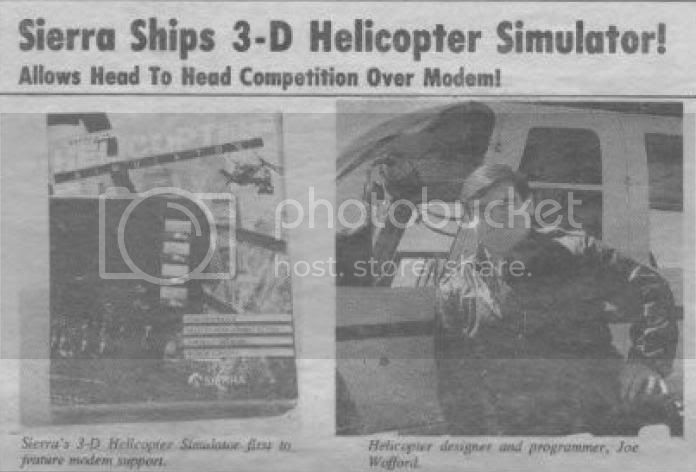 Issue 2: 1987 » Sierra Ships 3-D Helicopter Simulator! Sierra's 3-D Helicopter Simulator, shipping since September, is a red-hot combination of computerized flight training and realistic action. The program offers advanced graphics, three-dimensional landscapes with animated objects, modem support, and more. This is the first flight simulator to feature 16 color graphics in its extended graphics mode. Detailed scenery objects light up the screen in vivid colors. The 3-D Helicopter Simulator also offers authenticity to scenery areas through animation. Players can watch a drawbridge raise and lower as they cross the harbor, or take a view of the rotating radar dishes that welcome them home to air control. 3-D Helicopter Simulator is the first program to support modems with optional head-to-head simulator competition. Players can warm up against a computer-controlled opponent, then compete with a real-life partner across the room or across the world through modem hook-up. Whether flying in tandem, or engaging in air-to-air warfare, the experience is incredible. 3-D Helicopter Simulator offers features that aren't possible with airplane or jet flight simulators. Players can fly sideways, backwards, or hover in mid-air. Vertical takeoffs and tricky landings can become second nature with a little practice. Advanced special effects make the 3-D Helicopter Simulator really special to play. Players can employ fast or slow scan options to get a full 360 degree view of their surroundings, or they can operate the zoom control for extreme close-ups. With incredible out-of-ship points of view, a player can watch himself fly from different angles and distances. Watch from the ground, an orbiting satellite, or a tracking view from behind your helicopter. Players can choose from four playing modes: flight, target practice, combat (with computer) or optional dual-player combat. There are numerous scenery files to choose from as well. Tour your favorite cities with the "Sierra Helicopter" or an Apache attack helicopter. With so many options to choose from, Sierra's 3-D Helicopter Simulator will be an experience you will enjoy for years to come.